The complex tasks of sustainability and climate protection can be intimidating. This is where “Serious Gaming” comes in. Using the gamification approach unleashes creativity and makes finding innovative solutions playful and fun. We offer a simulation game for administrations and municipalities, which follows this approach, and we are going to introduce it to you in this blog article. Come and play with us on the 26th or 28th of March at the KIT Spring Days of Sustainability! What makes playing games so exciting? That we are not sure what comes next! The task of creating a more sustainable and climate friendly future includes a lot of uncertainty. However, feeling uncertain tends to block our creative capacities. The gaming format can dissolve these blocks and unleash our creativity and inspiration. Serious gaming is an approach that uses the creative potential of playing to address serious issues and co-create innovative solutions. Playing helps us to learn without even noticing it. This is why the element of playing is so relevant for a vital, sustainable society. In his seminal book “Homo Ludens”, the cultural historian Johan Huizinga pointed out wisely: human civilization has developed from and as a game and shall never quit doing so. Playing is the central activity in prosperous societies. Originally developed in the USA – now there is a version for Karlsruhe! The ”Serious Gaming”-workshop was developed in a cooperation with numerous partnerships between cities and universities in Germany, the United States and Mexico. We adapted the simulation game to the situation in Karlsruhe and developed it further. Recently, we played it under the project “Energy Transformation in Dialogue” with the team of Karlsruhe Climate and Energy Agency (KEK). The team had lots of fun and co-developed an idea they find so good that they are actually going to realize it. The next workshop is taking place together with the city in May when the Department of Environment is meeting the partners of the My Green City initiative. Six to twelve participants sit at a table. The workshop starts by putting the global sustainable development goals (SDG’s) into local context. 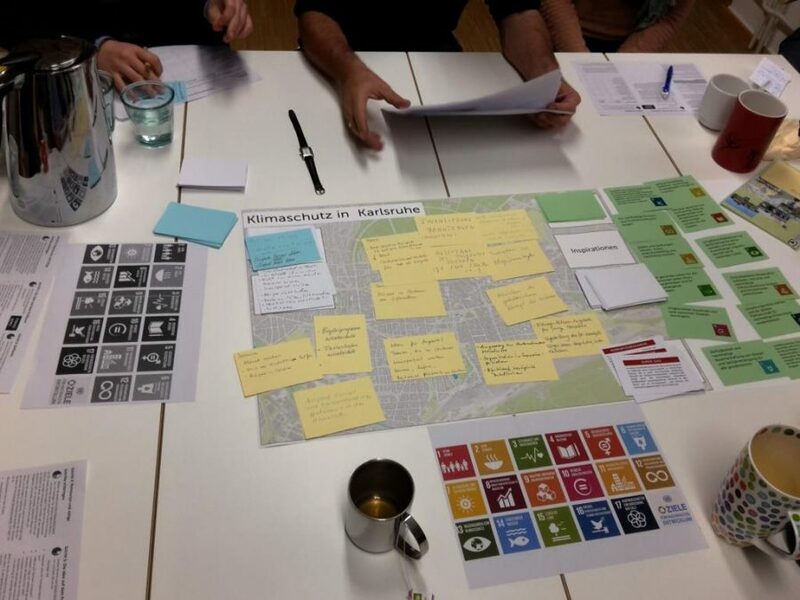 Which of the SDG’s are most relevant to Karlsruhe? Where do the participants see a need for action or have a personal motivation for change? From already realized best practice projects from other German and international cities, the participants choose examples that could also be realized in Karlsruhe. Based on these inspirations, one new idea is co-developed for Karlsruhe. In the course of this, the participants discuss which resources and actions are needed to realize the idea and which resources they could bring in themselves. Once the idea has taken shape, it is put to test with shock cards to see how resilient it is to changing conditions. What happens to the project at a century flooding? What effects do big employee strikes have on the project’s success? At the end of the workshop, the idea is reflected and if possible presented to the other tables. The workshop lasts about three to four hours, depending on the amount of participants. We invite you to join one of the workshops taking place at the KIT Spring Days of Sustainability – the workshop will be in English on the 26th of March and in German on the 28th of March. The main target audience are students, but auditors are welcome as well. You are an auditor and you want to participate only at this workshop? Write an email to ines.bott@kit.edu. You can find more information (in German) about the Spring Days here and about the registration here! 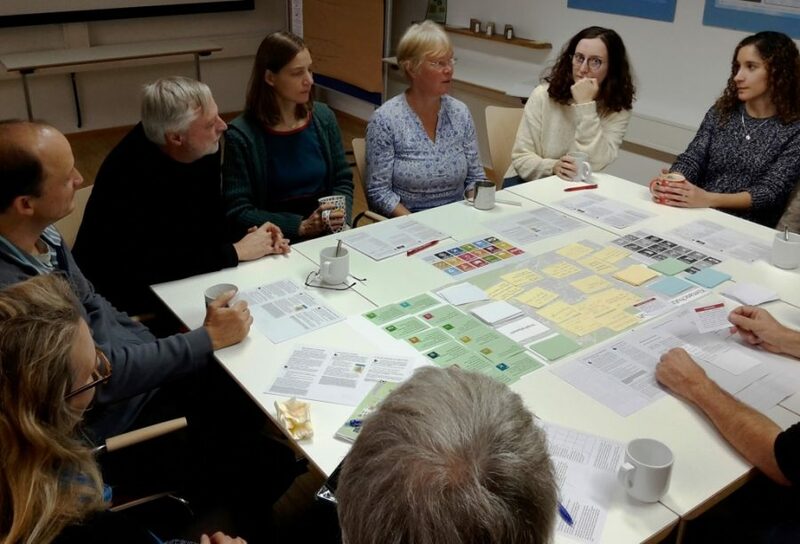 The simulation game was adapted and is further developed under the international collaboration project “Building Sustainability Implementation Capacity in City Staff and Leadership (CapaCities)”. This project belongs to the “Global Consortium for Sustainability Outcomes” (GCSO), a global network that advances solutions to sustainability problems through research, development and capacity building by generating, testing, implementing and, ultimately, bringing to scale a wide range of solutions including technologies, policies, economic incentives, social change and cultural practices. Read more.